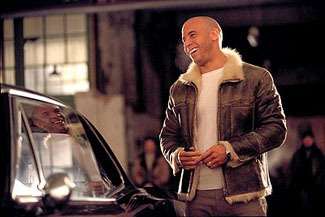 123/166 David Mumpower Vin Diesel shows no hubris, willingly humiliating himself for the sake of various sight gags. Unfortunately, most of them are beyond redemption. Are We There Yet is the much better implementation. Shane Wolfe (Vin Diesel) is a Navy S.E.A.L. who excels at his work and is proud of what he does. One day, he is assigned to rescue an American scientist from his Serbian captors. He gets the man (and his secret briefcase) to safety, but is blindsided by an attack. The professor is killed. Disgraced by his failure, Wolfe is thrilled when his commanding officer shows up in the hospital to offer him a chance for redemption. It seems that the professor, who was an expert in the field of security, was protecting a secret program known as G.H.O.S.T. Though the program was believed to be in the suitcase, it turns out that the professor hid it elsewhere. Excited about the prospect of solving the mystery, Wolfe is ready to jump to action. The enemy has been somehow led to understand that the program is hidden in the professor's home. The catch? His rather abundant family lives there, including a teenage son and daughter, a nine-year-old girl, a four-year-old boy and a baby. Wolfe has been assigned the task of protecting them from the forces of evil, especially because it's been reported that the bad guys think that the kids might have a clue about the programs whereabouts.